I was cropping my videos in blender after doing the screencast, this is so much better. Its working really well. Hope this feature is merged into the ffmpeg trunk branch, this deserves it. I should be more clear, its in git tree, but not yet released as a new version. Hey dude i have downloaded the ffmpeg from the git source - but you mentioned you forked this part off - how can I get your forked version and install it, so I can use this very useful feature? I am not sure what you meant by "downloaded." If you download tarball you must make sure its not the tag (they are for releases, the patched x11grab has been in release yet) but the latest tree. If you clone the git repo, it is there, but you need to turn it ow at configuring. ./configure --enable-gpl --enable-x11grabYour distro package has taken care of that part for you, but if you want to compile from source, you need to turn it on on your own.Moreover, some video/audio formats are not enabled by default. Run ./configure --help for more detail. "Package cairo was not found in the pkg-config search path. You commented on wrong blog post. The content/features in this page should have got into official ffmpeg for more than a year. 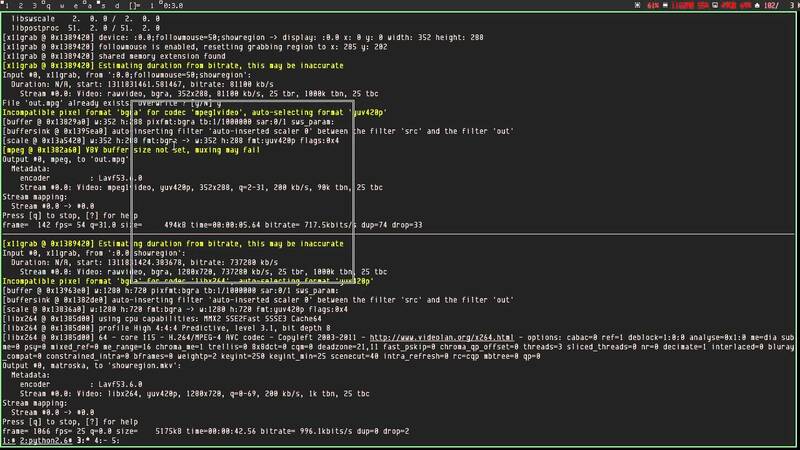 Check ffmpeg(1). For x11grabr, you need the development package of cairo in your Linux distribution for compiling x11grabr. Just a note, I have long given up developing it.